Not one crumb left behind. My mom comes and visits me her granddaughter almost everyday on her lunch break. She for the most part maintains a gluten free diet unless she stumbles across warm homemade bread (like she did yesterday). 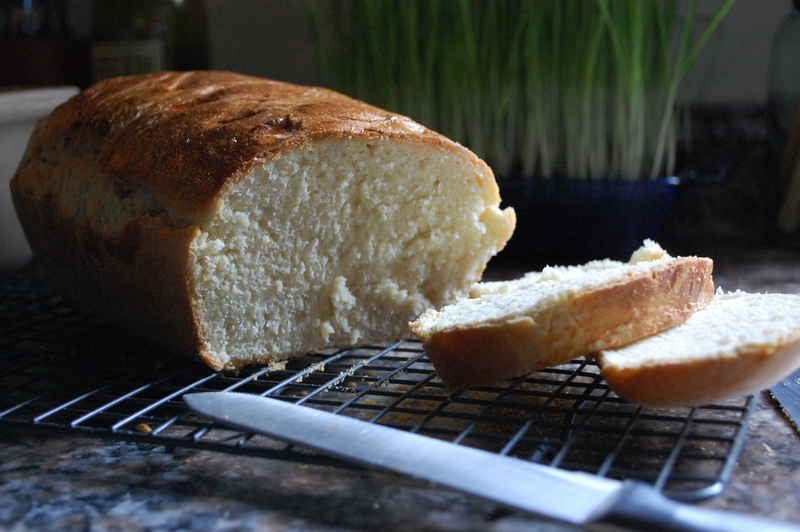 There’s something about freshly baked bread that will make the strictest crumble. 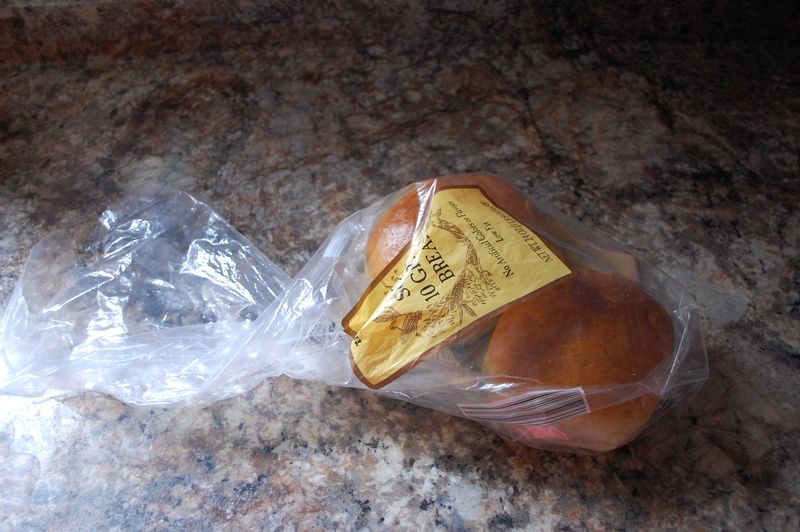 Despite knowing her rules about gluten I offered her a hamburger bun that I made a few nights ago. Mainly because it was sooo good and I knew she’d love it, but also because I want to make her proud. She didn’t believe that I made them! Now, I could take that as an insult as if she’s implying that I can’t cook, but she knows better. Instead, I laugh because my husband said the said the same thing the night I made them, “Wait, you made these?”. Yes, yes I did. After she pinched off pieces of the bread and wrapped it back up (talk about will power) with her mouth still full, “You need to write a post about that! Take pictures! That’s so good.” [Wipes hands] My job here is done. Okay, I need to give credit where it’s due – The Clever Carrot. She posted this recipe and it came out beautifully for me. 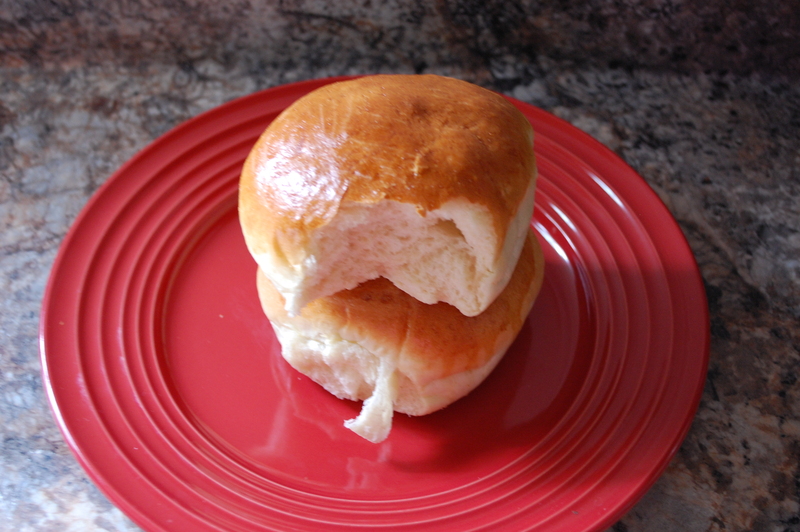 So if you’re looking for an amazing homemade hamburger bun recipe check out her blog here. We’re going camping this weekend and I needed a loaf of bread to take with us. 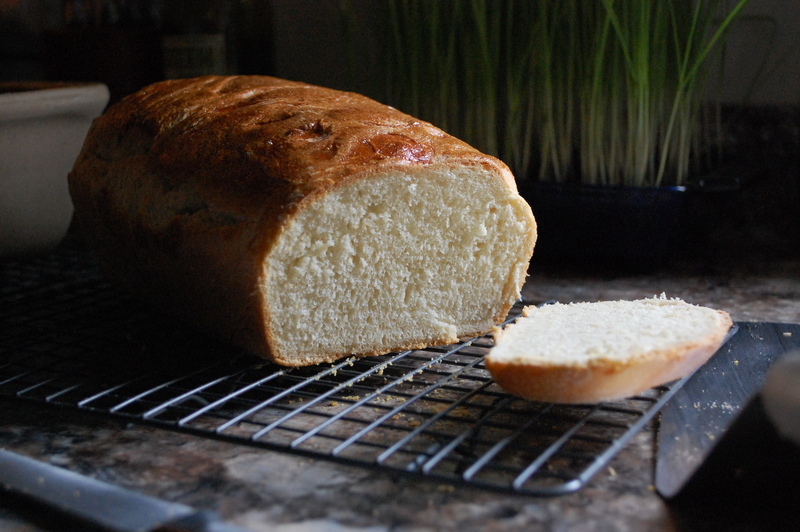 So why not make a loaf adapted from a recipe that already worked for me?! 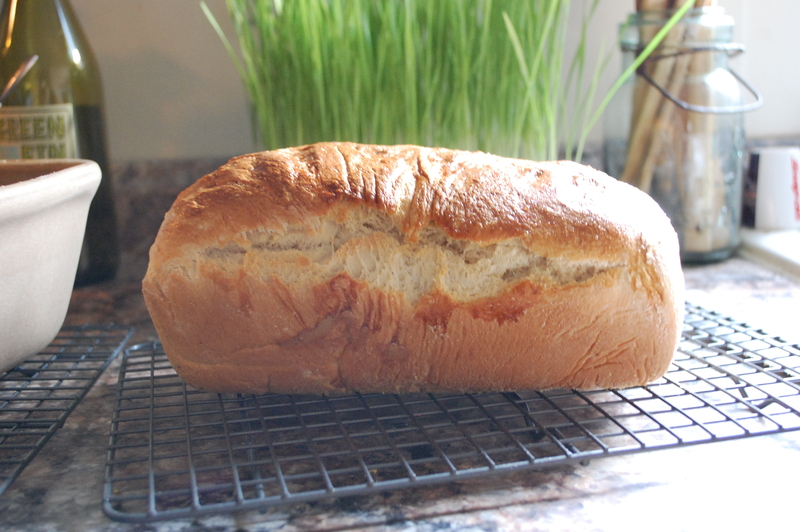 There really isn’t anything like fresh bread. It’s also pretty awesome saving money while eating bread better than you can buy. If you’re like me you’ll also enjoy the sense of “providing”. Combine the first four ingredients in a small bowl. I use my good ol’ glass Pyrex measuring cup. 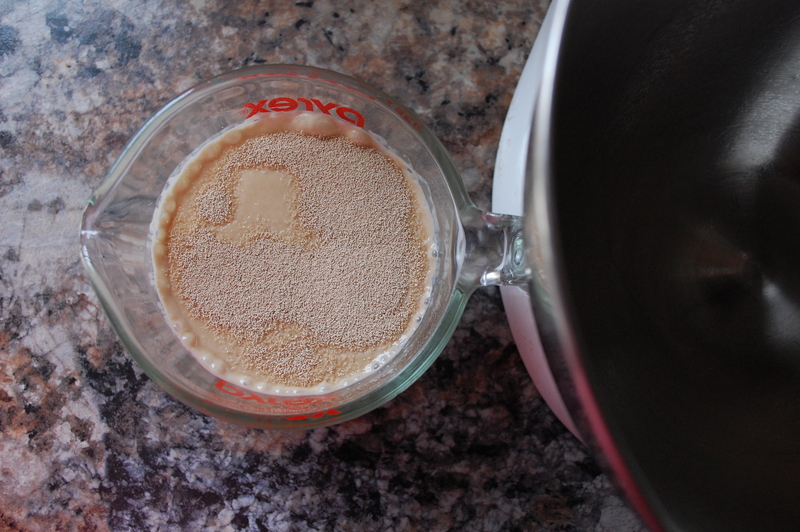 Add your water, milk, and sugar then sprinkle the yeast on top and let it sit for 5 minutes. While that’s resting, mix one of the eggs and set aside. The second egg will be used later in the recipe. That little egg shell better go into your compost! 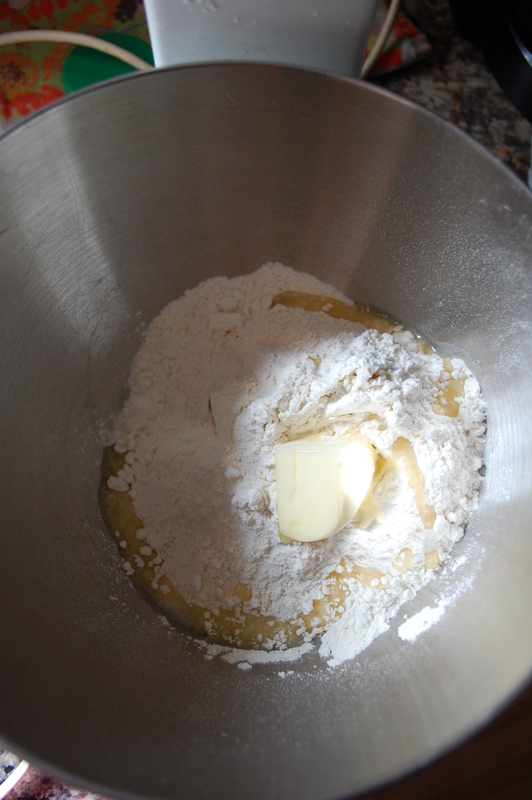 Now in your stand mixer, combine the remaining ingredients. 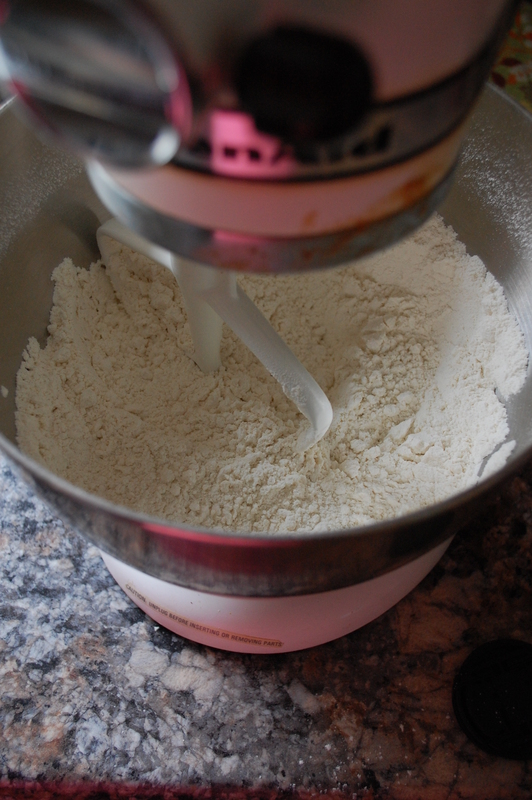 Attach your paddle mixer and mix on low until the mixture looks slightly crumbly. 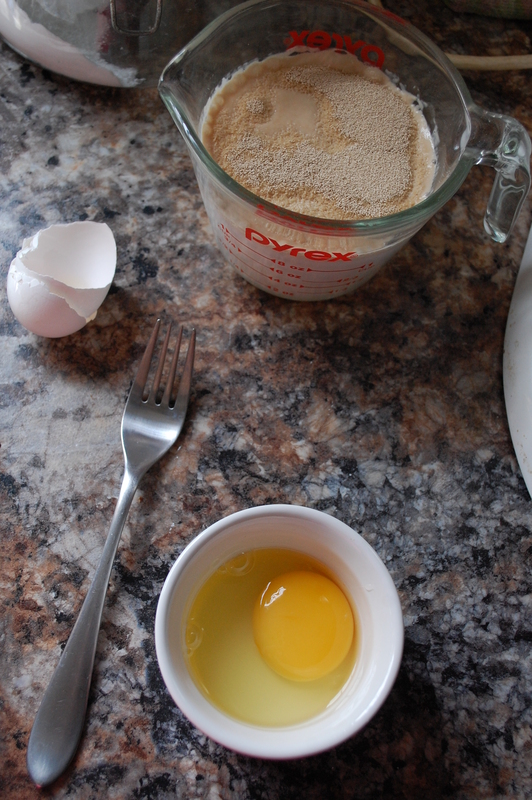 Now you will add your yeast mixture and your mixed egg to the bowl. 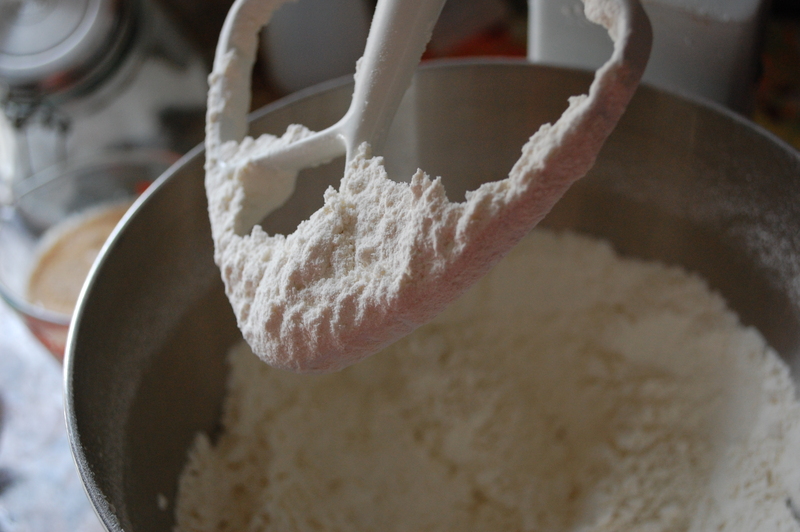 Using the same paddle you’ll mix this on low until it forms dough. I could tell you a time but every mixer is different and I normally just eye it. Just look for that slightly elastic texture. At this point you’ll need to switch from your paddle to your dough hook. 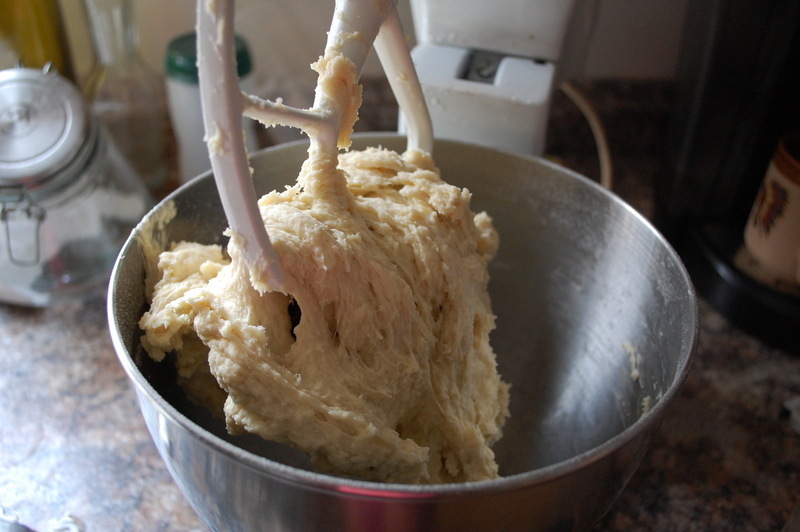 And set your mixer again on low and let it do its thing until it forms a ball of dough. 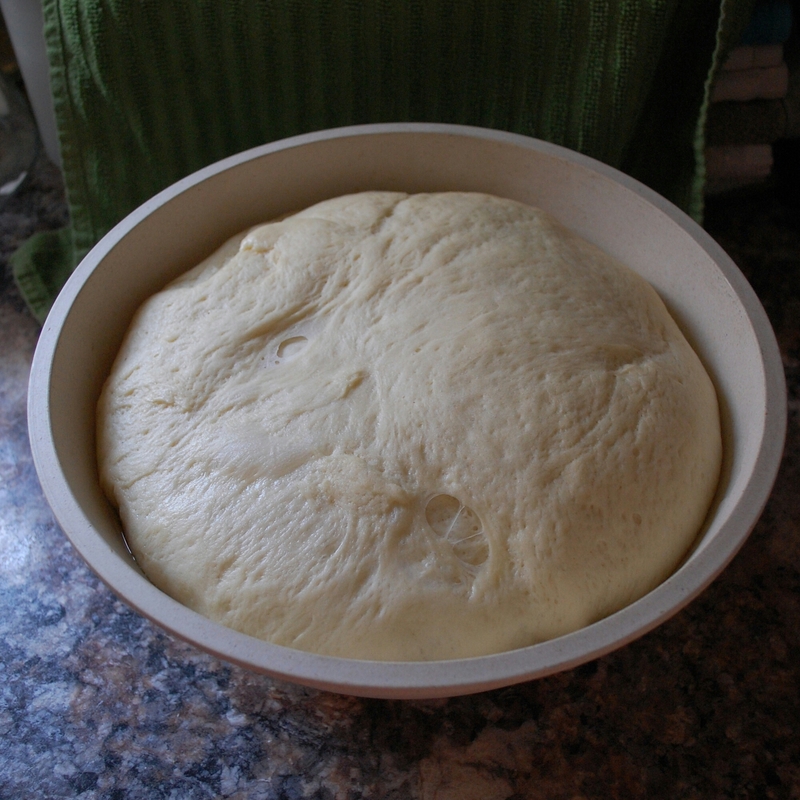 Now, you’ll need a extra large bowl let let your dough rise. You’ll want to coat it with olive oil so it won’t stick and find an area that is warm and free of drafts. 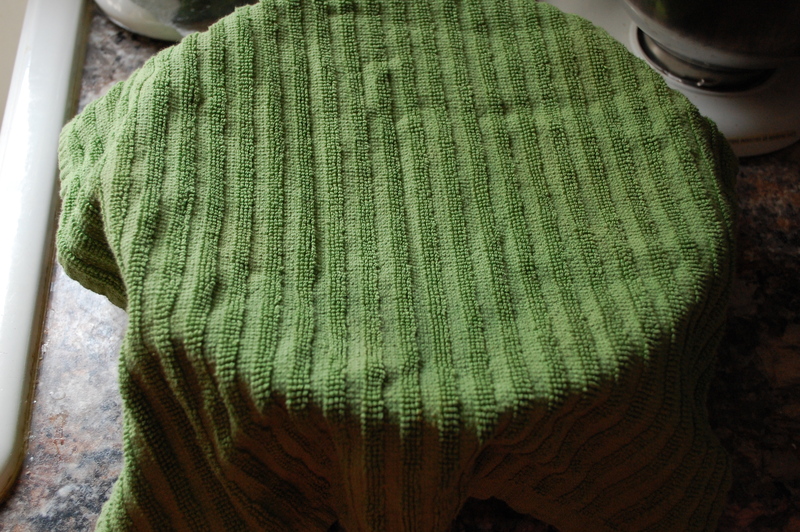 Cover with a kitchen towel and wait until it doubles in size. This should take a few hours but then again it depends on its environment. 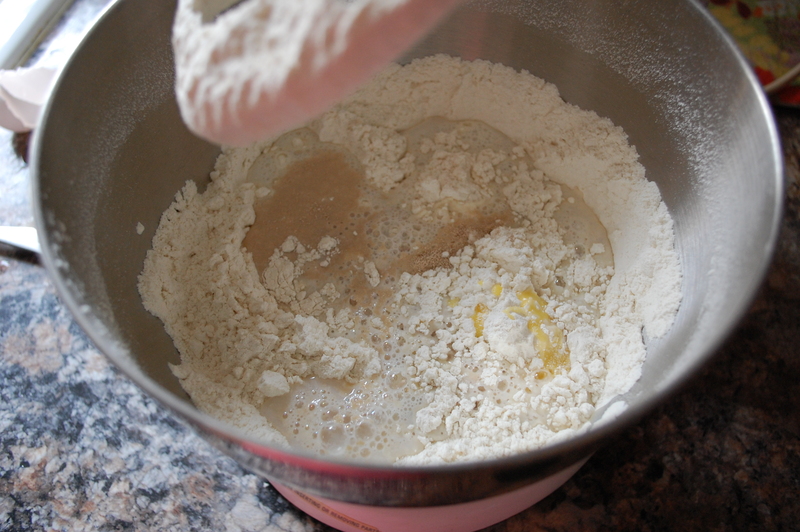 After it has doubled in size, punch it down and transfer it to a slightly floured surface. 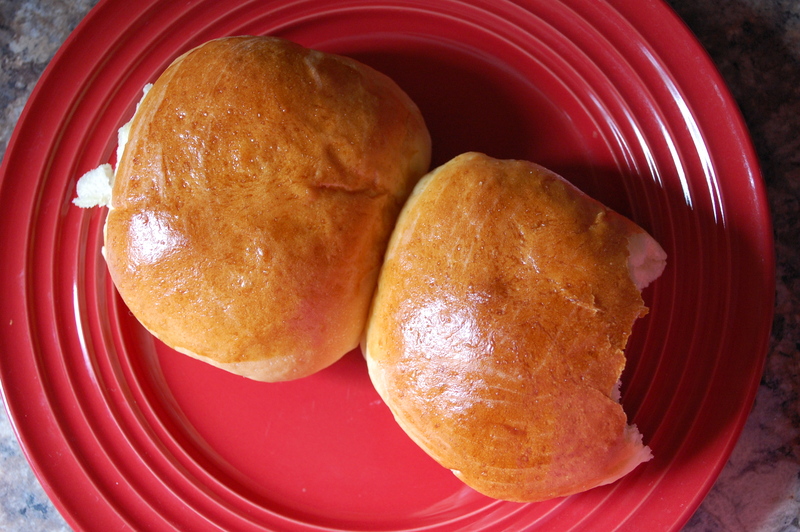 I used the same method that was used in The Clever Carrot’s hamburger bun recipe. 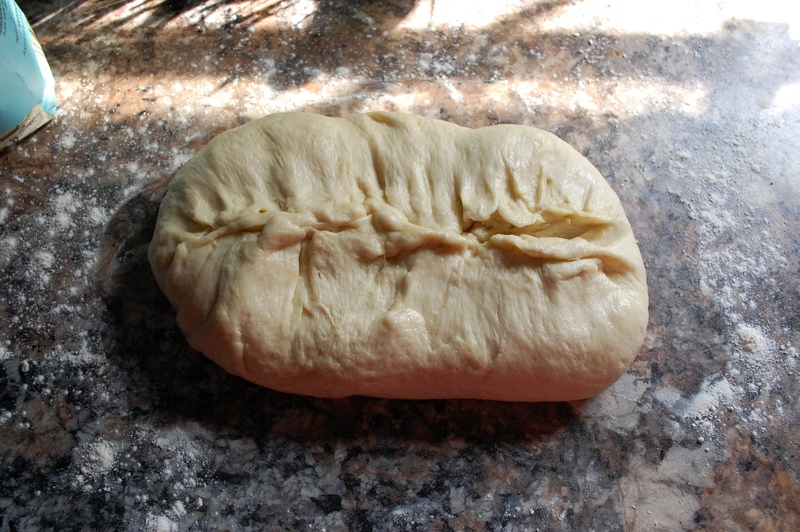 I folded the outer edges to the center then pinched them all together (this will be the bottom of the loaf). 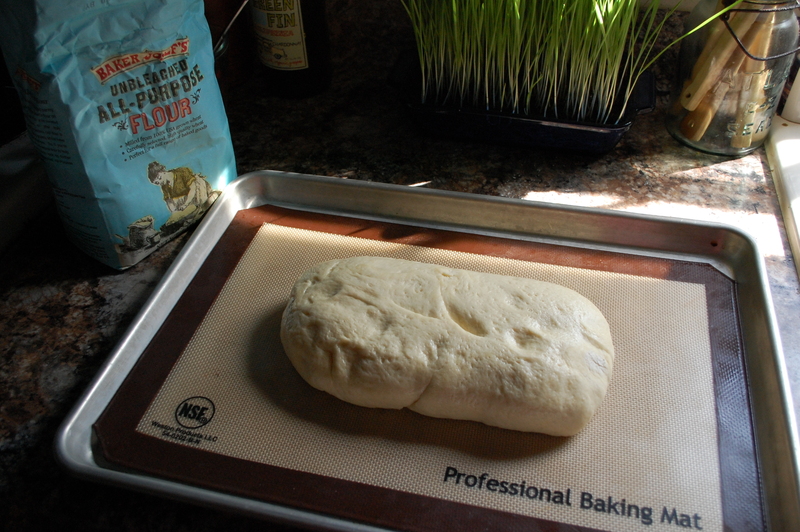 Then transfer it to a non floured surface (like a silicone baking mat) belly down to rise for a second time. 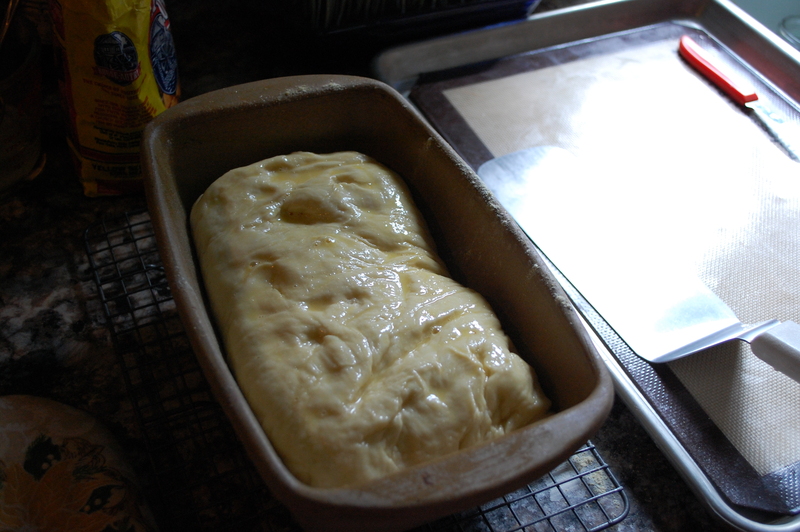 Gently shape it into the shape of a loaf and let it sit for about 30 minutes. 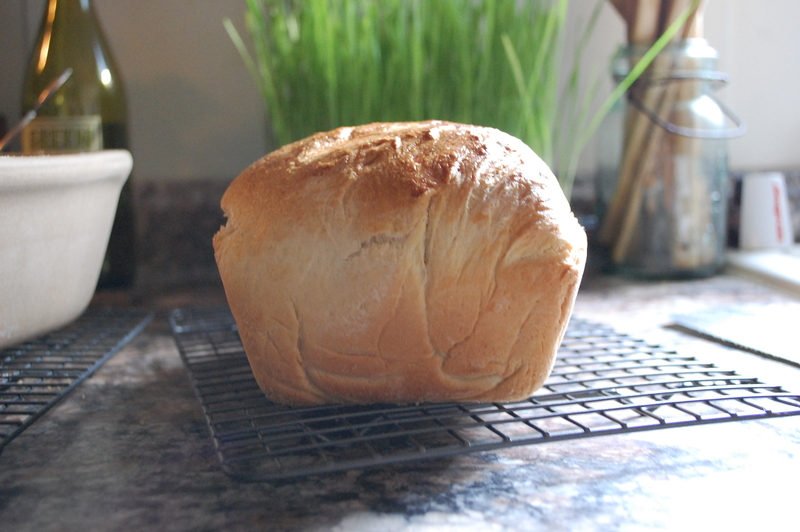 In the meantime, you’ll want to get out your good ol’ stoneware bread pan. Preheat your oven to 400 degrees and slide it in there and let the pan warm up with the stove. Putting cold stoneware in a extremely hot oven could shock it and cause your pan to crack. We definitely don’t want that. Also, putting a smaller oven safe dish on the lower rack with a little bit of water will keep moisture in the oven. Once your oven is up to temperature take out the bread pan and coat the inside liberally with olive oil then dust with cornmeal. My fear is for my bread to get stuck in the pan. 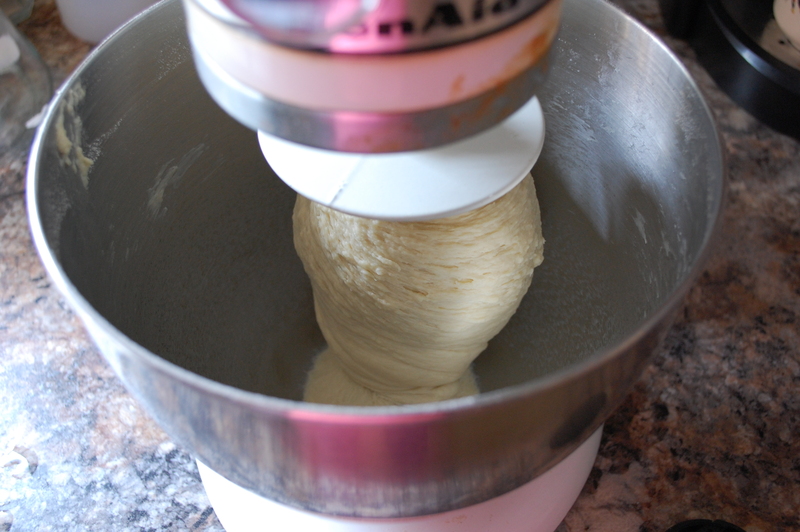 Doing this step made my bread come out with ease. Not one crumb left behind. For me putting the dough in the pan was awkward. I burn myself a lot and I’m sure that was a big factor in the awkwardness. Remember that long lost egg? Get it and wisk it up adding a splash of water. This is your egg wash that will give your bread a nice golden sheen when it’s finished. Baste the top of the loaf and slide that jewel back into the oven for about 35 minutes. Being that each oven varies, what you’re looking for is a nice golden brown top and when you tap on it the bread sounds hollow. 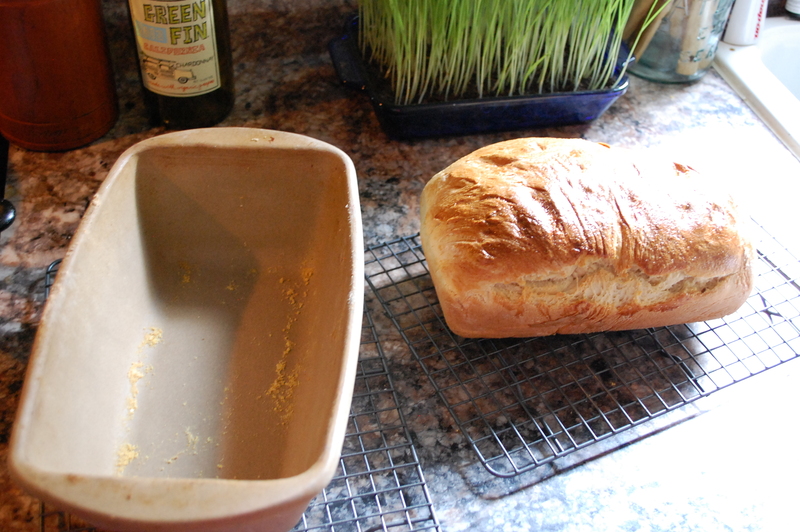 That metal spatula there is a huge help checking the sides to make sure they’re done as well as getting the loaf out. If you have one go ahead and get it. You can thank me later. Okay, so I bought my loaf pan warped at a discounted rate because these puppies are expensive. So my loaves are never perfectly shaped. So what. I’m not trying to win an award here. Ha. 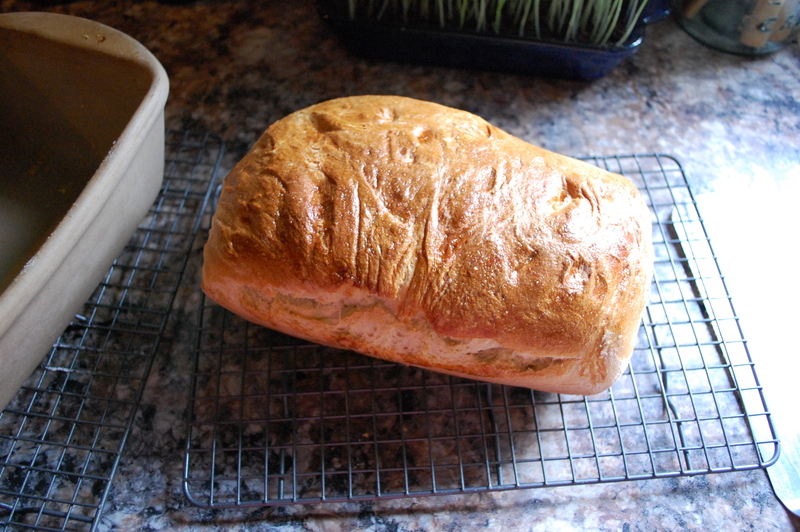 Place your pan on a wire rack to cool slightly before getting your loaf out. I’d say 10-15 minutes. 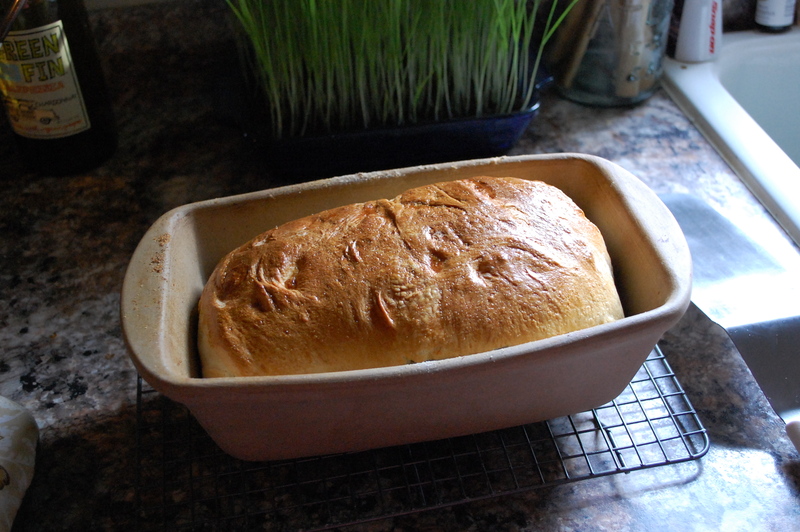 You don’t want to leave it in there to cool completely because stone holds heat and will continue to cook your bread. Place them both on a wire rack to cool. When you can’t take it any longer slice that loaf up and call that special someone (with bread still in your mouth) to let them know what just came out of the oven. For me, it was my mom. < Previous Transplanting – Regrowth and Rebuild. Next > Go get that “dough”! Ashley this looks so delicious! I can’t wait to try it as hamburger buns for BBQs this Summer. And I’m so glad I found your blog, I’m a SAHM, organic gardener, ex-money-earner too. Its a big change, but it’s worth it for the kiddos! Oh girl they are the best hamburger buns! I made that first and my husband swore they were bought. Ah thank you! I’m new to it but enjoying it! Yes a big change but so worth it. Simplifying your life will allow you to do so much more.. a lot would think it’s backwards!